I can’t help but feel that Origin are overstating their case here but what Origin FX consists of is a collection of screensavers for Windows 3.1. Some of them feature artwork familiar to people who have played some of Origin’s games. Others are entirely original. Around half of the screensavers include sound support through either an MT-32 or Adlib/Soundblaster. It isn’t a product that sold very well leading to a degree of rareness, but it can be picked up relatively cheaply off Ebay despite that as not very many people would be interested in owning a copy. Origin weren’t the only company to put out a screensaver package around this time. Lucasart’s did a Star Wars set of screensavers and Sierra did the classic Johnny Castaway, both of which were more successful. The edge that Origin FX had over those 2 products was it’s potential ability to tie into Origin games and play cutscenes from them. It came with support for Wing Commander 2, but as far as I know only 1 game was ever released which expanded upon this support (Serpent Isle) and that was limited to playing the intro and ending scenes. It’s kind of hard to review a screensaver package, from 20 years ago and I’m not going to attempt to go into any detail here. Some of the modules are only marginally better versions of what already came with windows such as the debris starfield effect. Other’s are reasonably good fun such as the cat and mouse chasing each other around the screen. They all have random elements so there is the chance of seeing something different each time. I especially like the menagerie module which has monsters from Ultima 7 wandering around the screen. As an Origin fan, I could actually see myself using that one today if it worked in Windows 7. The most impressive module is the Wing Commander 2 one which randomly plays cutscenes from the game, with a random piece of background music from the game. Unfortunately the cutscene is only 1/4 of the screen since Windows 3.1 didnd’t support swapping resolution on the fly but they still look good in the little window. 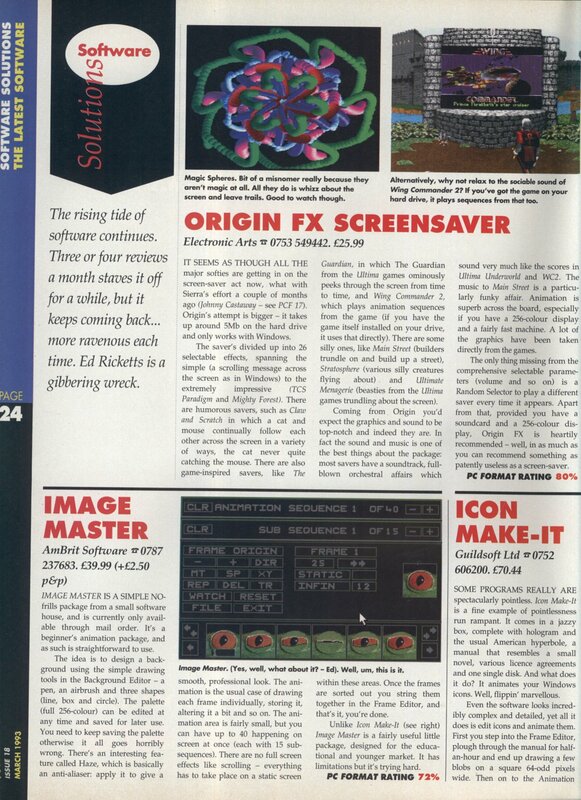 The manual describes Origin FX as being a high-end product for Windows 3.1 and I actually believe that. It wasn’t easy to do too much in Windows 3.1 back in 1992 and for its time this was reasonably good without actually being great. If they had gone on to support it further and expand it with every new game they released it could have ended up being quite something, but I presume this idea was dropped after the poor sales. The inherent problem with this idea is that screensavers are mostly used in offices and they might not have taken to someone installing Wing Commander 2 on the hard disk just so they could run a screensaver. Maybe the system specs would similarly be an issue. It’s an unusual miss for Origin anyway and was worth a look. There was already a video up on youtube showing part of Origin FX, but I’ve put another one up below showing every module, with the sound coming off an MT-32 this time.